Cruising has gained enormous popularity in recent years—for good reason. It’s basically an all-inclusive vacation—accommodations, meals, activities, and entertainment are part of the package—and you only unpack once even though you travel to a variety of ports and countries. If your budget allows, you can choose extras—spa services, shore excursions, specialty dining, and shopping. If this sounds like the ideal vacation for your family, here are a few tips to make sailing on a ship even better. Choose your cabin wisely. Cabins in the middle of the ship, both front to back (fore to aft) and top to bottom are the quickest to book. If you are picky about where you stay, book early for the best selection. Lower decks generally have the least motion and are quieter because there are no public areas on these decks. If you’re traveling with children who are old enough to sleep in a separate room, adjoining cabins are wonderful. You can leave the door between rooms open or close it for privacy. Pack lightly. The days of cruises requiring fancy formal wear are gone. Even if your ship has “elegant” nights, the standard of dress is much more casual than it used to be. Many ships, especially for voyages more than a week in length, have self-service laundromats, so you can wash clothes and wear them again, if necessary. Although most beds onboard are high enough to slip luggage underneath, you don’t want to take up valuable closet space storing multiple suitcases. Nesting pieces, where one fits inside another, are a good way to conserve space. Bring your own drinks. Most cruise lines allow one bottle of wine per person to be brought onboard. Some ships also allow passengers to bring limited bottled water and soda onboard at embarkation only. Check on your specific ship’s policy. However, if you take a bottle of wine into a dining room or bar area, expect to pay a corkage fee. 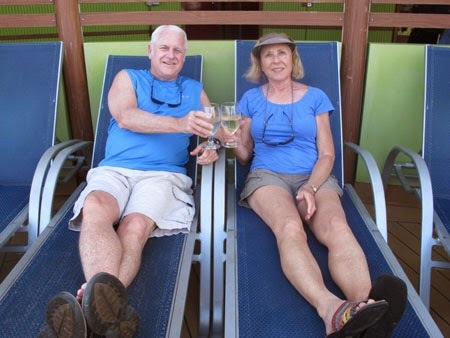 Better to enjoy a pre-dinner drink on your balcony or by the pool and avoid the extra charge. that we brought onboard the ship. Skip long lines. Everyone is excited to start their vacation, so lines can get long during embarkation. Print your boarding pass at home and arrive before the first hour of embarkation (sometimes you can board before the stated time), and you’ll likely avoid the longest lines and standing for what seems like hours. When disembarking at a port—if you don’t have a planned excursion to meet—wait until most of the passengers have gone ashore. Later, you’ll be able to walk right off the ship and start exploring on your own. A bonus: You’ll have the ship’s amenities to yourself for a couple of hours. 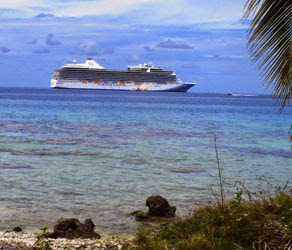 In fact, some passengers stay on board while the ship is in port just to enjoy the peace and quiet and lack of crowds. Stay healthy. If you need patches or medication for motion sickness, be sure to bring these with you. Bring allergy meds and extra of any prescriptions you need. A good basic first aid kit with bandages, something for sniffles or a mild cough, upset stomach, headache, and other common travel maladies will keep you from needing attention from the ship’s doctor, which can be expensive (but a godsend if you really need medical attention). Avoid over-imbibing on food or drink. It’s your vacation, so take time to rest and relax.